Fort Brooke was a military post situated at the mouth of the Hillsborough River in present-day Tampa, Florida, this fort was established in 1824, soon after Florida was acquired by the United States from Spain. In 1823, Colonels George Mercer Brooke and James Gadsden were ordered to establish a military presence on Tampa Bay in the newly acquired Florida Territory to contain the Seminole Indians according to the Treaty of Moultry Creek and to curtail illegal activities along the Gulf coast. On January 10, 1824, Colonel Brooke and four full companies of the U.S. 4th Infantry Regiment from Pensacola established “Cantonment Brooke” atop an ancient Indian mound, most likely built by the Tocobaga culture centuries before. 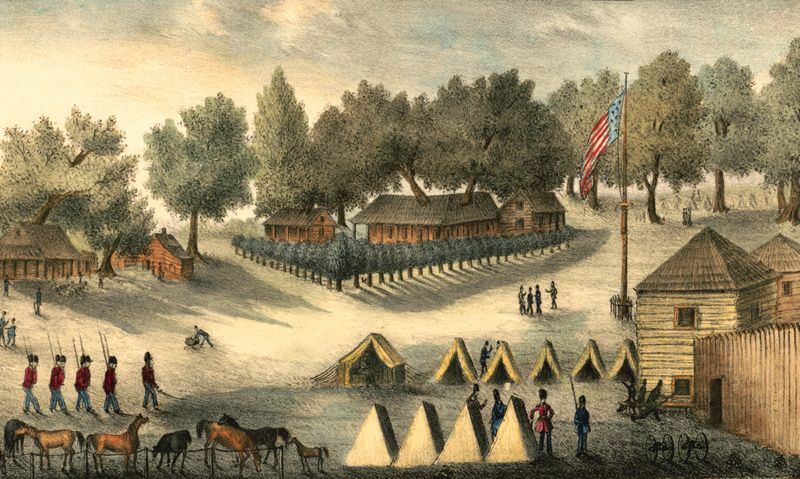 Brooke directed his troops to clear the area for the construction of a wooden log fort and support buildings, but he ordered that several ancient live oak trees inside the encampment be spared to provide shade. Later that year, the post was officially rechristened, Fort Brooke. Fort Brooke would serve as a major outpost on Florida’s west coast during all three Seminole Indian Wars and in the Civil War. The fort also played a part in the development of the village of Tampa. In October 1863, the Civil War Battle of Fort Brooke was fought after two Union Navy ships bombarded Fort Brooke on October 16th as a diversion to make another attack. Union troops then launched a landing party under Acting Master T.R. Harris. They disembarked at Ballast Point and marched 14 miles to the Hillsborough River. On October 18th, the Battle of Ballast Point took place when the Union troops arrived at the Jean Street Shipyard and captured the blockade running steamer Scottish Chief and sloop Kate Dale. The remains of the Kate Dale sunk near the west side of Jean Street Shipyard, while the Scottish Chief remained afloat while it burned. It was towed back to Tampa and stripped and destroyed. The Rebels destroyed the steamer A.B. Noyes to preclude her capture. After the burning of the ships, the Confederate forces were alerted to the raiding party’s location, and commenced pursuit. Harris’s Union forces were surprised by a detachment of the garrison, the 2nd Florida Infantry Battalion. A brief but sharp exchange resulted in a few casualties before the Union troops returned to sea. On May 6, 1864, both Fort Brooke and Tampa were captured by Union forces. As Tampa languished during the 1870s and early 1880s, so did Fort Brooke. The last roll call of soldiers occurred in 1882 and the post was decommissioned by the U.S. Army in 1883. After the fort’s closure, most of the land was opened to homesteaders, and some garrison buildings remained on site. Shortly after the post was decommissioned, Fort Brooke became an independently incorporated town in 1885 and was annexed by Tampa in 1907. Fort Brooke was located on what is now the southern end of downtown Tampa beneath the Tampa Convention Center. There are no remains of the fort today, but two of its cannons are now located on the University of Tampa Campus. When the City of Tampa was building the Fort Brook Parking Garage, a forgotten cemetery was unearthed that contained the remains of U.S. soldiers and Seminole Indians. The soldiers were reburied in military fashion and the Indians were reburied on the ground of the local Seminole Indian Reservation.